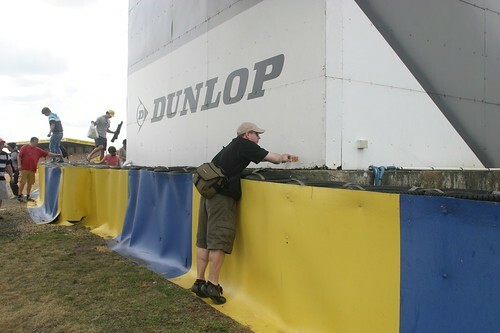 The 24 Hours of Lemons Forums → Bench Racing → Want a Get-Out-Of-Penalty-Free Card? Topic: Want a Get-Out-Of-Penalty-Free Card? Participate in Jay's Mom's T-Shirt Contest Idea! Sometimes Mom has a great idea. And in the case of Jay's mom, not only did she have a good idea, but Jay's dad thought it was a dud. In Jay's estimation, that means it passed the Reverse Dad Filter Test--meaning it must be a really good idea! The rules are simple. Wear your Lemons gear (t-shirts, hats, whatever....) to one o'those established racing events--you know, NASCAR, ALMS, or as Jay's mom overheard from somewhere, "An SCAA race, whatever that is." While your there, have someone snap a picture. Preferably next to famous race drivers, inside the Sprint Cup Courtesy Tent, or with that security guy that's in the process of kicking you out. Either post the picture in this thread or email it to me or Jay, and cash in on your freebie at the next event. Re: Want a Get-Out-Of-Penalty-Free Card? OK, where can I buy some gear quickly? I'm going to Buttonwillow next weekend for an SCCA race. 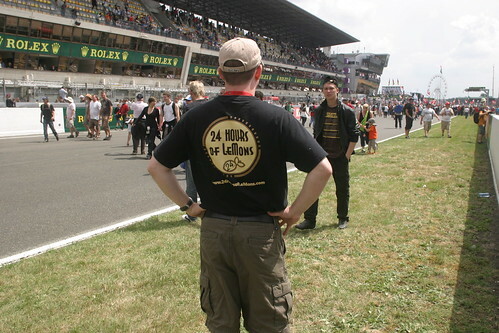 How about some Lemons gear at Le Mans? do we get free from BS laps & black flags if we pull a Tim Jenkins? 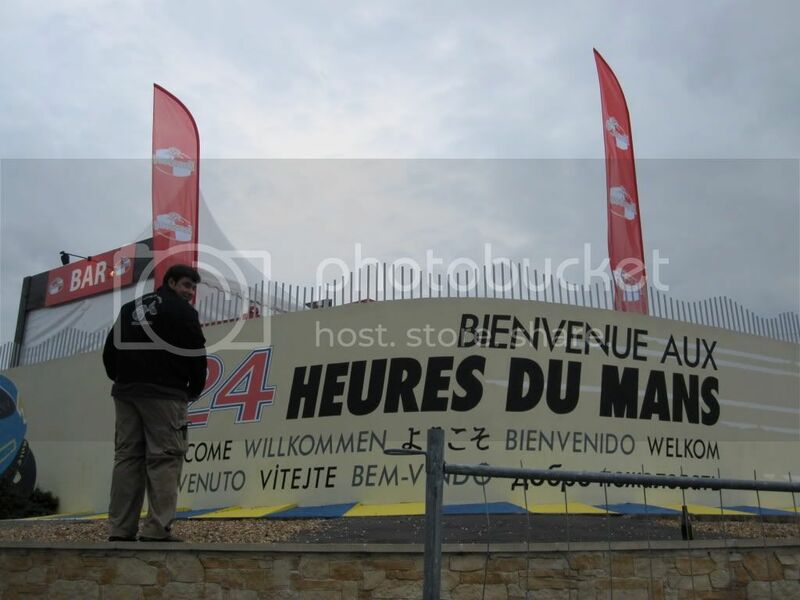 I didn't get down to the track, but I climbed up by the sign! Keep 'em coming. Tetanus Neon and Cannonball Bandits get free passes! If you need gear, email Jeff at: jeff at 24hoursoflemons.com. 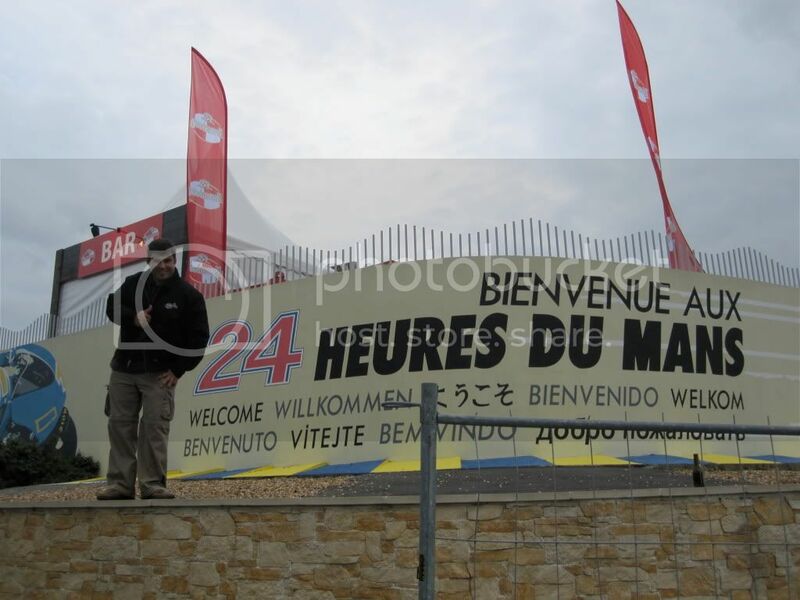 damn... wore mine to the ALMS race at Laguna few months ago, but didn't get a snap of myself. Me and the GRAND-AM Rolex Series team and manufacturer trophies. Sweet. Be sure to post your team name with your photos so we know who you are. Slap a sticker on something when nobody's looking. Also, given my proximity to Daytona and Sebring, I really need to go see some racing. Dirty Some Beaches shirt at Monza for Italian GP Qualifying. We found Felipe's and Fernando's cars and checked out the legendary banking. Oh, I could have killed this one a few years ago. Where's that damned like button... AHH FACEBOOK YOU HAVE SCARRED ME!!! is the Texas Mile an "established" racing event? Exactly. There is a precedent. I noticed a hole in a certain semi-famous bridge and patched it with a Lemons sticker. Always be prepared to fix stuff. Just for the record, we got 200 BS laps....might need a bigger sticker? Hay, you're on here! Did you get the 200 laps before or after you put that sticker on the truck? Good job, BTW. it warmed my heart to see Lemons in a real racing series. We wanted to do a Pimp Theme or add the appearance of a hula skirt but haven't come up with a sponsor to back the idea. We're still holding on to hope that one day we will go through NASCAR tech in costumes and a bottle of Jack. The driver said he'll walk down pit road before the race wearing whatever we tell him to wear.